When Apple announced a downward revision of its guidance for the holiday quarter, the first quarter of Apple's fiscal 2019, investors and shareholders focused on the negatives, and rightfully so. But as is typically the case with press releases like this, it tried to emphasize the positive aspects of Apple's recent performance to sugarcoat the negative core message. And while there are in fact plenty of positives, the problem for Apple is that the iPhone has gotten so big that disappointing iPhone sales are enough to drag the whole company down, regardless of how well the rest of Apple's business is doing. According to Tim Cook's letter to shareholders, Apple's revenue outside the iPhone business grew by almost 19 percent year-over-year, including revenue records from Wearables, Mac computers and Services. While Apple is still widely considered a hardware company, its services segment, including Apple Music, Apple Pay, the iTunes and App Store among other things, has grown into a huge business in recent years. So big in fact that it is now Apple's second largest source of revenue. 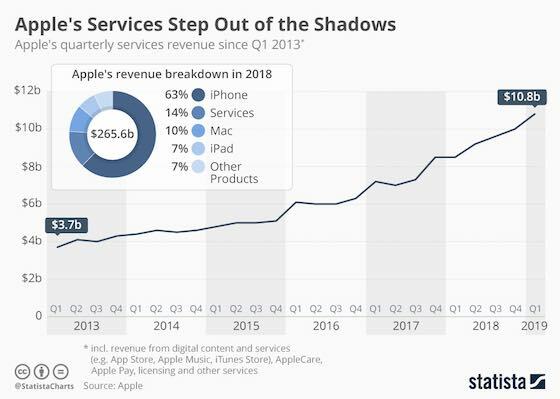 Having been considered a tool to tie consumers to Apple's universe and ultimately improve hardware sales for many years, recent statements and actions indicate that Apple has started embracing Services as an opportunity of its own rather than an instrument to sell more iPhones. Bringing Apple Music to Amazon Echo devices and iTunes movies to Samsung TVs would have been unthinkable a couple of years ago, as it goes contrary to Apple's famous walled garden approach. Apple's declared goal is to double its Services business between 2016 and 2020. As the chart above shows, Apple is on track to achieve that goal.